The Regal Christmas Wreaths are truly fit for a king. 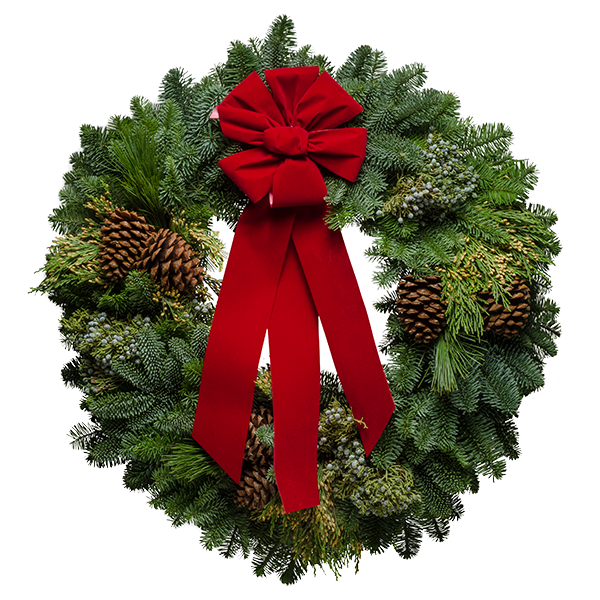 The word Regal of course means �of or having to do with royalty� or �befitting a king, queen, emperor, or empress.� These descriptions both sure do apply to these beautiful fresh Christmas wreaths. Our elves fashion the freshest noble fir boughs and princess pine from the forest into extra large one-of-a-kind wreaths. The Christmas Forest elves selectively harvest the evergreens and assemble them with the utmost care. Then they totally transorm the elegant fresh wreaths with colorful desert berries. They adorn the Christmas decorations with pastel blue juniper berries, incense buds, and ponderosa pine cones. Finally, they top them off with luxurious red velvet bows. It's a regal feast for the senses! Give one of these dazzling Christmas wreaths to someone special on your list. Better yet, you can send us your entire gift list and we will deliver a fresh Christmas wreath to each gift recipient's door. They will love seeing this eye-catching Christmas wreath on their front door. "Just received my beautiful wreath and noticed a white tag on it saying that Angie assembled it. Please tell Angie she did a great job and that this awesome wreath now hangs on my front door in Michigan for all to enjoy thanks to my boyfriend's parents who have been purchasing your wreaths for years. It is such a wonderful gift!"